Refiners Syrup, or Partially Inverted Refiners Syrup is a pleasant tasting thick syrup with a rich unique flavor. It is a by product of the refining of cane sugar. It is excellent for cooking and for certain recipes. It should not be confused with corn syrup which is usually produced with enzymes. Refiners syrup consists of invert syrup, and sucrose. Invert syrup is basically sucrose broken down into it's component parts, fructose and glucose. Nor is it the same as cane juice syrup, or cane sugar. Both of these are produced from sugarcane but are almost 100% sucrose. Refiner's syrup contains large quantities of fructose and glucose in pure form. It does not contain molasses or any of the goodness or nutritious vitamins or minerals from the cane plant. In this sense it is very like refined sugar, but with a different flavor and texture. The sugar cane is boiled and the sugar crystallizes. This is removed and the process repeated. Refiners syrup is a byproduct of one stage of this process. 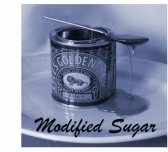 Unlike molasses it does not have the minerals or other solids left over, just certain forms of sugar and moisture. Refiners Syrup, Partially Inverted Refiners Syrup, Golden Syrup. The most famous is Tate & Lyle's Golden Syrup which has been sold since 1883.